A pond filter is one of the most important components of any garden pond whether it be a fish pond or simply a water garden feature. Getting the correct size of fish pond filter is one of the pond owner's most common mistake. Allow us to help you choose the correct one. Below, you will find some information regarding various types of pond filters including how they're used and how they differ. All types of pond filtration systems consist of a pond filter, filter media, a pond pump and pump tubing. Some koi pond filters have a built in UV clarifier. You will need electricity near the pond to run the pump and the optional UV (ultraviolet clarifier or sterilizer). The advantage of having a pond filter that is submersible is that it is out of sight and can be hidden in the pond. Most of them are made out of black plastic which can be easily be camouflaged and somewhat hides with a black pond liner in the background. The disadvantage of having the garden pond filter inside the pond is that it can be inconvenient to get to and clean it out. A gravity fed koi pond filter is an external filter that sits on the shore somewhere. The water that comes from the pond pump enters in this filter near the top and flows through filtering media products to the bottom of the unit. The water that gets discharged from this filter will need to flow down to the pond. The water cannot flow uphill (or against gravity) to any type of water feature. If you have a waterfall, you can locate this filter near the waterfall and let the water coming from the filter to go into the waterfall unit or waterfall area. There is also a type of pond filter that is pressurized. This means that the filter can either work as a gravity fed filtering system where the water has to flow down to the pond or it can flow up to a waterfall unit or somewhere uphill. Some of these pressurized pond filters can be partially buried along the side of the fish pond, too, making it more convenient. As with any type of water pond filter, you can easily cover them with one of our fake rock covers to conceal it within the nearby landscape. The past few years, several manufacturers have combined the benefits of having a pond filter with a built-in UV light. This can be a great feature for most garden pond owners who do not have a large volume of fish. Within the pond UV filter chambers, water passes by the UV light where it kills algae, some fungus, bacteria and parasites. The dead algae & fine silt particles gets trapped in the filter pads where they can be removed. This type of filtering system makes it convenient for most garden pond owners. You have the benefit of having a pressurized filter so it can be located partially buried at the edge of the pond or can be placed on top by a waterfall unit. It's really quite a neat little package. Another type of pond filter is a vortex filter. This predominantly filters out large solids before flowing to a waterfall unit. With a waterfall unit, the filter pads can be hard to clean as they are located at the bottom of the waterfall unit. The Vortex Solids Filter (VSF) is a pre-filter that removes themajority of solids from the water prior to the waterfall filter where biological filtration occurs. How it works: Incoming water enters the VSF at a slight downward angle. The heavier solids are pushed to the outside and directed towards the bottom by the grooves in the outer wall. A drain port makes for easy cleaning of the solids that accumulate in the cone shaped sediment area at the bottom of the filter. The water then flows through a filter pad at the top of the filter (where it is easier to clean). After the fine solids are taken out, the water then flows via gravity out thru three air entrainment ducts, which enrich the water with oxygen. Lastly, there is one other type of fish pond filter or koi pond filter and that is a bead or bio-tube filter. These are used predominantly for large koi ponds or fish holding tanks where a large volume of fish are held. These filters can offer superior filtering performance and are super easy to use. Some come with a complete backwash system where you simply turn a valve on the top of the filter and the incoming water washes the bio tubes or beads within it and discharges it out the drain system. 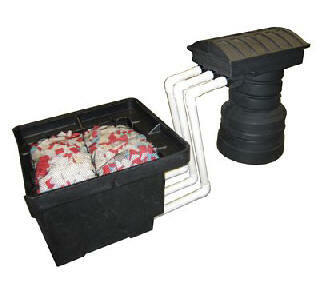 For this type of pond filtration system, you never have to get your hands dirty by rinsing out pond filter pads! 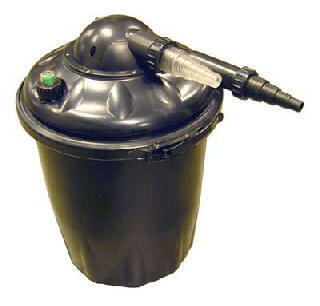 While not inexpensive, these pond filters work great at keeping your fish pond water clean. One important point to consider when installing the plumbing for your pond filter is if you should get a fish pond filter that has a UV in it, you will need to shut off the UV for a few days when you add beneficial bacteria to your pond. This is so you don't kill the bacteria. Water visibility and overall pond health is very dependent on the beneficial bacteria that lives within the pond, filter media, etc.. Without it, your pond will be green, stinky, smelly and your fish will die. It's really, that important. To determine the size of your fish pond filter you will need to know how many gallons of water your pond holds. For those with preformed ponds, this can be easy as it will state right on the unit. For those who have created their pond with a pond liner, you will have to do a little math. To calculate the number of gallons your pond holds, this is the typical formula: Length of the pond times width of the pond times depth times 7.5. This will be the number of gallons your garden pond holds. Say that you calculated that your pond holds 3,000 gallons of water. You will need to filter this total volume of water every 3 to 4 hours. So, divide 3,000 gallons by 3 and you get 1,000 gallons every hour. This would be part of the information you need to determine what size of pond filter to get. 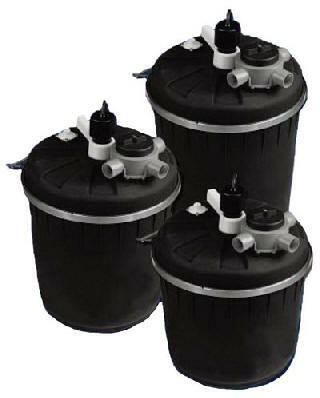 Koi pond filters are designed to adequately filter a certain volume of water along with a particular size of fish load. A fish load basically means, how many fish you have and what size they are. This is where the majority of people make a mistake so please pay attention to this. Getting the wrong size of pond filter is one of the most common mistakes most fish pond owners make. If you have a pond that holds 3,000 gallons and are looking at a pond filter that filters 1,000 gallons you're only partly on the right track. You will need to look at the specs for the filter to see how large of a fish load this filter is for, too. If the manufacturer states that it is only for a fish pond with 5 or 6 fish that are 6" long, and you have 30 fish that are 6" long, then this will not be the correct size of filter for you. You will need a filtering system that is much larger or else you will have to get rid of a lot of fish so you are within the parameters that the filter is suitable for. This is where so many people make the mistake. Either they get the wrong size of fish pond filter to begin with or they may get the right size filter but the fish multiply thereby putting more demands on the pond filtration where it can no longer do an adequate job keeping the pond clean. You can replace your pond filter pads and media as needed. We have a selection of replacement filter pads and offer custom size pond filter pads of varying thickness. 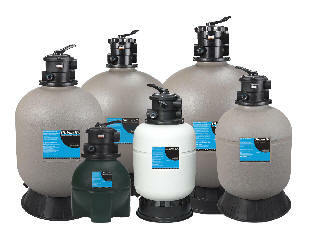 We also have bio-balls™, bio-ribbon, and other media for filtration systems. To properly clean your pond filter pads, simply use some clean pond water - not tap water. Put the water in a large bucket and swish the pads around in it. You can also bang your filter pads along the pavement or side of the bucket which will help dislodge the larger particles. We are happy to help you select which type of pond filter you may need. We know the math and everything can be a little tricky for some folks particularly when you're calculating what size of pond pump you need for the filter and for a water feature. A simple solution for new pond owners is to buy a pond kit which has everything you need to create a beautiful pond. At PondSolutions.com we have 1000s of quality pond products. Let us know how we can help you enjoy your water feature even more - with the right selection of pond supplies and friendly, helpful advice.